How do you print full-color photos on shirts and material? Have you ever seen a t-shirt with a full-color photo printed on it? Maybe you've noticed a kiosk in the mall that will print your personal photo in full color on the front of a t-shirt or tote bag? The process used to create these products is called dye-sublimation. 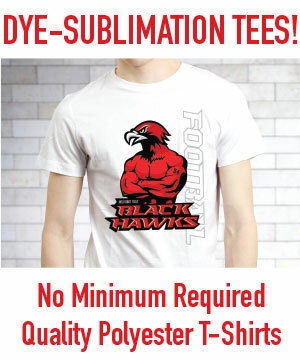 Dye sublimation is not an ink on surface printing process. This technology uses heat to open the pores of polyester based textiles and products to accept sublimation dye that converts to a gas.While the poly pores are open the gas enters and fills the material with dye. As the product cools, the dye literally becomes a part of the material. Unlike screen printed images, a sublimation print will last as long as the material does. You literally have to wear out the material to see any deterioration in image quality. Or if you're prone to more technical jargon… Dye-sublimation printing is a digital printing technology using full color artwork that works with polyester and polymer-coated substrates. Also sometimes referred to as digital sublimation, the process is commonly used for decorating apparel, signs and banners, as well as novelty items such as cell phone covers, plaques, coffee mugs, and other items with sublimation-friendly poly-coated surfaces. The process uses the science of sublimation, in which heat and pressure are applied to a solid, turning it into a gas through an endothermic reaction without passing through the liquid phase. Tower Media Group can print your photo or artwork image on a variety of product with no required minimum. That's right, if you only want one shirt, one tote bag or a single mug. we can print it for you! This dye sublimation print technology yields vivid color and amazing print quality on a variety of products. T-shirts, mouse pads, tote bags and mugs are our most popular products, but there are many other products that are compatible with sublimation printing for you to consider. Next time you want to create a gift or keepsake from a photo image or artwork, give us a call and we'll help you create the perfect product for any occasion.